Alasdair MacIntyre is one of the most controversial philosophers and social theorists of our time. He opposes liberalism and postmodernism with the teleological arguments of an updated Thomistic Aristotelianism. It is this tradition, he claims, which presents the best theory so far about the nature of rationality, morality and politics. This is the first Reader of MacIntyre's work. It includes extracts from and synopses of two famous books from the 1980s, After Virtue and Whose Justice? Which Rationality?, as well as the whole of several shorter works (one published for the first time in English) and two interviews. Taken together, these constitute not only a representative collection of his work but also the most powerful and accessible presentation of his arguments yet available. 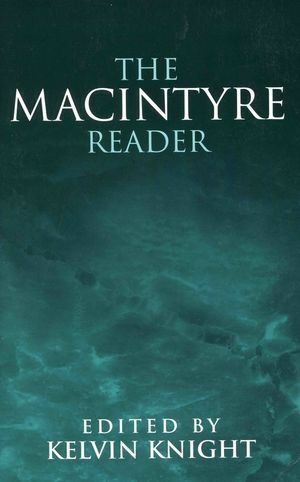 The Reader also includes a summary, by the editor, of the development of MacIntyre's central ideas, and an extensive guide to further reading. Students will find the book a useful guide to MacIntyre's case against both capitalist institutions and academic orthodoxies. Part I: Establishing the Project:. "Notes from the Moral Wilderness". Part II: Combining Social Science with Moral Theory:. 'Social Science Methodology as the Ideology of Bureaucratic Authority'. 'The Claims of 'After Virtue'. After Virtue: A Study in Moral Theory (extracts). Part III: Establishing a Tradition of Practical Rationality:. 'Précis of Whose Justice? Which Rationality?'. 'Practical Rationalities as Forms of Social Structure'. 'Plain Persons and Moral Philosophy: Rules, Virtues and Goods'. Part IV: Challenging Contemporary Philosophy:. Whose Justice? Which Rationality? (extracts). First Principles, Final Ends and Contemporary Philosophical Issues. 'Moral Relativism, Truth and Justification'. Part V: Challenging Contemporary Politics:. 'The Theses on Feuerbach: A Road Not Taken'. 'Politics, Philosophy and the Common Good'. Part VI: Reflecting on the Project:. An Interview with Giovanna Borradori. The Editor has written a very helpful introduction which lays out the main themes and debates in MacIntyre's work.